Summary of the Hunchback of Notre Dame by Victor Hugo - Learn to speed read in 2 day course with the top Speed Reading experts in the UK. Speed Reading courses in London, UK. Speed Reading strategies to increase reading speed, comprehension and memory. In-house speed reading courses in the UK. Later that night Gringoire, now destitute and forced to walk Paris’s cold streets, watched in horror as two men, one of them hooded, abducted the beautiful dancer Esmerelda. Gringoire called for the guard and drew closer to the scene, where he could see that the hooded man’s partner was none other than Quasimodo, who, on orders from the other, struck Gringoire to the ground. Phoebus, the captain of the guard, appeared and commanded the two men to free the gypsy girl. In the ensuing melee, Quasimodo’s accomplice released Esmerelda and escaped. She, moved by Phoebus’s bravery, immediately fell in love with him. Gringoire soon ran into a band of thieves and beggars, who threatened to hang him unless one of their women agreed to marry him. Just as the noose was lowered about his thin neck, Esmerelda stepped forward and volunteered herself. The couple was married, but Gringoire did not enjoy a wedding night – Esmerelda now loved Phoebus; she had rescued the poet merely out of pity. Meanwhile, Quasimodo, for his part in Esmerelda’s attempted kidnapping, was sentenced to a flogging in the marketplace and a one-hour public humiliation on the revolving pillory. Bleeding and exhausted, he was soon overcome by thirst and pled for water. As expected, his plea was greeted with scorn by the throng, who hurled stones and insults at him. But once more, just as she had with Gringoire, Esmerelda appeared. The derisive crowd parted as she ascended the pillory and placed a water flask to Quasimodo’s swollen lips. “A big tear was seen to trickle slowly down his deformed face … perhaps the first that he had shed since he arrived at manhood.” Quasimodo spied Frollo in the distance, which mitigated Esmerelda’s kindness; secretly, the Archdeacon had become infatuated with her and wanted her for himself. To Quasimodo, all but this curious and enchanting girl had turned away from him. Over time, Esmerelda’s love for Phoebus turned more fiery; she even trained her goat to spell out her secret love’s name with alphabet blocks – an act many considered irrefutable evidence that she was a sorceress. At the same time, Frollo became more jealous of Esmerelda’s attraction to Phoebus. One day, learning that the pair planned a rendezvous, he followed them to the prescribed spot and watched from a hiding place. When he saw Phoebus kiss Esmerelda, the priest, overcome by envy, leapt out and plunged his dagger into the captain’s breastStunned, Esmerelda pulled the dagger from Phoebus’s body; then, as the assailant fled, she fainted. Unknown to Esmerelda, Phoebus had not died from his wound. On the day of the execution, he and his new fiancée gazed on at the court proceedings. Soon to be married, he did not come forward. Esmerelda, however, caught sight of him, but unfortunately too late. Her doom was sealed; there would be no rescue. Frollo came to give Esmerelda last rites and once more to offer himself to her; once more she refused him. Taken to the town square, the hangman was just about to place the noose around the innocent’s neck, when Quasimodo vaulted up on the scaffold, scooped the girl into his arms, and carried her into the cathedral, shouting, “Sanctuary, Sanctuary!” Safe within Notre Dame’s walls and high atop the bell towers, the hideous hunchback held the girl aloft for the delighted crowd to see. After Esmerelda had rejected him, Frollo had hurriedly left the proceedings, missing the girl’s rescue; indeed, he assumed she had been hanged. 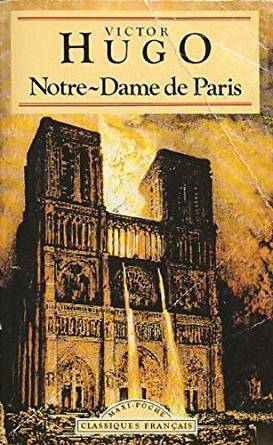 He wandered the streets of Paris and reflected on “the folly of eternal vows” and “the vanity of chastity.” Later, when he returned to his room in the cathedral, he looked out at the spires of Notre Dame and there beheld a spectacle that made him shudder. “‘Twas she herself, pale … sad … she was free. She was dead.” The sight of her “ghost” chilled his blood. Atop the cathedral towers, Quasimodo brought Esmerelda food and blankets. “In the day time you shall stay here,” he explained, motioning to the locked doors. “At night you walk about all over the church. But stir not a step out of it either by night or by day, or they will catch you and kill you and it will be the death of me.” Esmerelda, at first frightened by her rescuer’s gruesome appearance, was joy-struck when she found that he had saved her goat as well. “Never till now was I aware how hideous I am,” Quasimodo said, gazing upon the lovely girl. “When I compare myself with you, I cannot help pitying myself, poor unhappy monster that I am.” When Esmerelda asked him why he had risked his life to save her, he replied, “You have forgotten a wretch who attempted to carry you off, a wretch to whom the very next day, you brought relief on the ignominious pillory. A draught of water and a look of pity are more than I can repay with my life.” Then, giving her a whistle that would warn him if anyone came to abduct her, he departed. Archdeacon Frollo had since learned that he had not seen Esmerelda’s ghost and that she was, in fact, in the cathedral. He secured a key to her room and tried to force himself upon her. As repulsed and terrified as ever, Esmerelda blew the whistle. Quasimodo suddenly sprang from the darkness and, not recognizing his guardian, attacked him. But when he heard Frollo’s voice, the devoted creature groveled at the feet of his master, murmuring, “Kill me first and do what you please afterward.” It was only the girl, now armed with a sword – and Quasimodo’s presence – who prevented the priest from any further mischief. Frollo slunk away, still vowing that if he could not have her, no one would. Frollo, still determined to have his gypsy prize, now concocted a scheme to free her from Quasimodo and to win her love. He enlisted the aid of Gringoire (whose purpose was to obtain the trick goat with which he could make money) and his band of robbers, who, blind to the priest’s deadly intention, were happy to come to Esmerelda’s aid, she being an outcast like themselves. Gringoire’s band would attack the cathedral, claiming that the sanctuary had been rescinded, thereby creating a diversion that would allow Frollo to spirit Esmerelda away. Quasimodo, however, met the robbers with a hail of beams and stones, and with a rain of molten lead. This defense gave the king’s guards time to gather at the cathedral and rout the attackers on the steps of the church. But Frollo’s plan, in the end, was successful. As the siege raged on outside, he slipped into the cathedral’s upper chambers, abducted Esmerelda, and turned her over to the authorities. Quasimodo disappeared, never to be heard from again. But in the open grave of criminals outside the city, two skeletons lay locked in embrace: one horribly misshapen, the other small and delicate. As an example of the Romantic movement, Victor Hugo’s monumental novel, rich in human emotion and filled with a wide range of characters, is somewhat atypical. How the loving and the innocent survive – and, many times, die – in the corrupt world in which they find themselves is a touching spectacle. We recognize the contrast between the hunchback’s noble character and the twisted, disfigured soul of the staid Archdeacon Frollo. The book’s theme, then, is that it is society rather than human nature that binds and fetters people, and that, though imperfect, we truly are created in the image of God. And as Quasimodo and Esmerelda show us, only through human kindness and acceptance can we transcend physical limitations and achieve spiritual reunion with God.